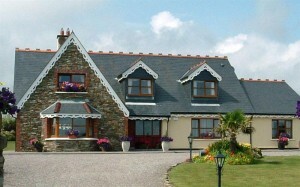 Woodlands House Bed & Breakfast in Kinsale is a luxury, four star approved B&B accommodation. It is nestled neatly in a quiet area overlooking the picturesque harbour town of Kinsale in County Cork. Comfort is guaranteed as visitors are treated to complimentary refreshments on arrival, power showers, en-suite rooms and king size beds. Breakfasts are home cooked and offer a wide selection of dishes. An array of in-room facilities are also available to guests, including free Wi-Fi Internet, tea and coffee making facilities, TV, hairdryer, room safe and ironing facilities. The large garden provides a quiet, relaxed atmosphere, while private parking guarantees peace of mind in Kinsale. The harbour town of Kinsale is a mere seven-minute walk from Woodlands House Kinsale Bed & Breakfast and offers visitors a selection of gourmet restaurants, sailing, deep sea angling and golf. Kinsale is an Irish Heritage Town and has benefited from a rich and interesting past, which has resulted in a plethora of historical remnants being sprinkled around the town. Among the highlights are the 17th century Charles Fort, the Church of Ireland church built in 1190 and a 16th century Tower House. Kinsale ideal for Golf, Woodlands House is close to Kinsale’s two golf course’s and is the perfect location for the golf enthusiast in Kinsale. We can make enquiries on behalf of our guests. (1) Cobh where you can visit The Queenstown Story centre, The Titanic centre and St. Coleman’s Cathedral. FotaWildlife Park, Fota House and Gardens, Midleton Distillery where the Jameson whiskey is produced and you can take a guided tour. (2) Blarney Castle, Cork City, St Finbarre’s Cathedral, the English Market, Cork City Gaol. (3) Clonakilty, Glandore, Drombeg Stone Circle, Skibbereen, Mizen Head. (4) Bantry, Bantry House, Glengarriff Bamboo Park and Garnish Island. (5) Wild Atlantic Way Woodlands House is at the start of the Wild Atlantic Way. Car Hire is available from Cork Airport Car Hire and City Car Rentals which is only 20 minutes away. There is a regular Bus service to and from Kent Train Station, Cork City and Cork Airport. Kinsale is a fantastic location for touring the heart of West Cork, Valerie and Brian will be happy to advise you on the many scenic tours you can take. Contact: Valerie & Brian Hosford.